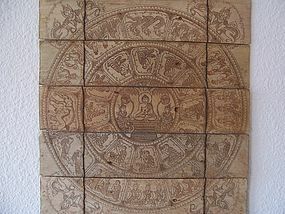 From our Southeast Asia Collection, a small but fine Burmese ink on palm leaf sutra with thayo embossed wood covers, depicting Buddha under the Bodhi Tree of Enlightenment flanked by two adorants in the center medallion, then encircled by disciples and zoomorphic entities in the surrounding images. The reverse side contains sutra writings in Burmese script, not yet translated. Overall workmanship is quite fine with great attention to detail, reflecting the devotion, reverence, and skill of the craftsman. Size and Condition: 21 inches tall fully extended, 10 inches wide. Some general wear commensurate with age and use, including some light thumbing to the edges of a few sutra leaves, one or two instances of minor splits in the palm leaves, but overall condition is excellent. A Large, Published, Inscribed, Dated, Burmese Buddha Extra Photos for Item 990732, Published Burmese Buddha A Good and Large Vintage Indonesian Batik "Painting"